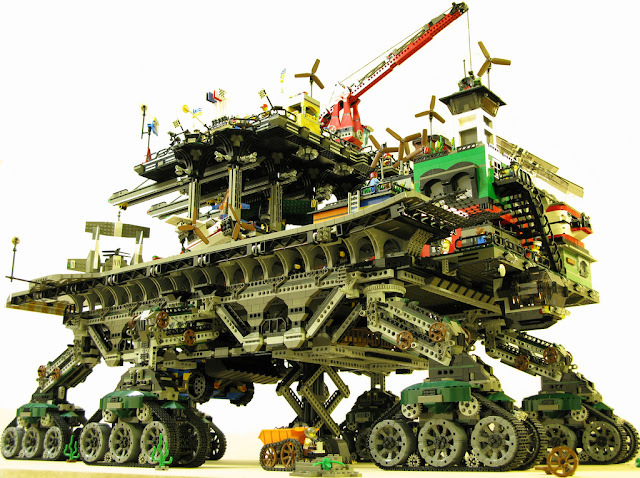 LEGO lover David Degobbi built the most incredible crawler city I've ever laid my eyes on. He describes it as: "Crawler town roams the barren wastes of a post steam-punk world after cataclysmic climate change do to excessive coal use." And it's got everything on it. BitRebels put it best: "Living areas, elevators, gardens, a hanger, sliding hooks, a runway, cranes, storage rooms, food courts, solar panels, construction areas, crawlers, a grandstand... as I said, I could go on forever." Check out the Bit Rebels article or the Flickr site for more high-res pics.